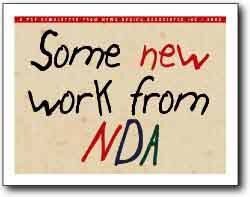 THE NEWSLETTER WITH A DIFFERENCE: Wow, we knew we were taking a chance when we asked our young pal Albert to write, design and produce the second issue of NDA's company newsletter. But now we've got it, we're not quite sure he followed our brief for an upmarket publication that would attract lots of work. Check it out and then let us know how much we should pay him and his pal Harley for all their hard work. 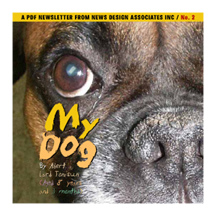 News Design Associates, publisher of ColdType, is an international editorial and design consultancy with clients in Canada the United States, Scotland, Ireland, South Africa and Kenya. The company, which has won many international awards for its work, specialises in redesigning existing newspapers and magazines and planning the structure, content and design of new ones. NDA is headed by Tony Sutton, a former newspaper and magazine editor and designer, who has worked for major newspapers and magazines in England, Scotland, South Africa and Canada. He also spent five years as editor of Design, the quarterly magazine of the international Society for News Design. 10469 Sixth Line, RR#3, Georgetown, Ontario L7G 4S6, Canada.